Resist the urge to work! Why not when you can dive into this two-person Sunbed with Canopy and relax to the max. Ultimate good looks and soft, weather-resistant fabric keep you cool and comfy on hot days and nights. Add in the combination of superior larch hardwood (for heavy weight capacity) and durable synthetic Texteline material (for retarding mould and mildew) and this all-in-one hammock becomes a super lifetime value. The classic director's chair is now suitable for outdoor as well as indoor use. Rust proof, powder coated, aluminum frames plus durable PVC sling insures the Take Two can take on the toughest conditions. The slings are slightly padded for added comfort and dry quickly after a summer shower. Ideal for smaller spaces like condo balconies, they fold compactly for storage or to slip in the trunk for use on camping trips or kids outdoor sports evens. The Take Two director's chairs is ready for anything. Finally, all-weather seating that lets you take lounging seriously. This folding Adirondack chair with pull-out ottoman ensures you get the most out of your nap. Classic charm with modern ergonomic structure, extendable ottoman and adjustable backrest. Crafted of solid wood harvested from the Cypress tree family with decay resistance similar to Western Red Cedar. Expect many years of comfort. Ideal for porch, patio or poolside. 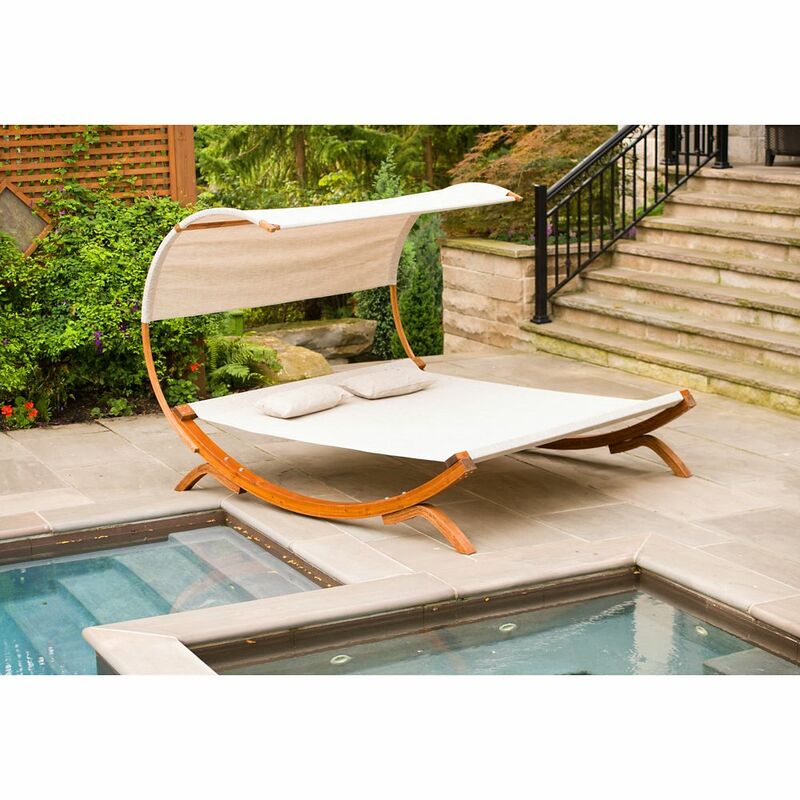 This Cabana Double Chaise Lounge Daybed transforms any outdoor space into a relaxing Zen oasis as it offers a restful outdoor retreat. With a sturdy aluminum frame wrapped in weather-resistant wicker with a modern design, this Daybed will enhance the overall finished look of your outdoors. The padded Sunbrella cushions offer great comfort for lounging. Built to last, this Double Daybed co-ordinates with other pieces in the Cabana collection. Sunbed With Canopy Resist the urge to work! Why not when you can dive into this two-person Sunbed with Canopy and relax to the max. Ultimate good looks and soft, weather-resistant fabric keep you cool and comfy on hot days and nights. Add in the combination of superior larch hardwood (for heavy weight capacity) and durable synthetic Texteline material (for retarding mould and mildew) and this all-in-one hammock becomes a super lifetime value. Sunbed With Canopy is rated 3.5 out of 5 by 2. Rated 2 out of 5 by DSPR from Difficult to Aasemble and Broken on Arrival This product looked nice in the showroom. However, it was extremely difficult to assemble and one of the large, wooden legs was cracked. That said, the thought of having to disassemble it to return it wasn’t worth the aggravation. We’ll likely have to replace it in the spring. Rated 5 out of 5 by Heidi from Absolutely lovely!!! I can spend hours on this thing! Well... Absolutely lovely!!! I can spend hours on this thing! Well worth the money!!! Is the canopy retractable or removable? The canopy on this sunbed can be removed. How much weight will this hold? This item holds up to 500lbs.